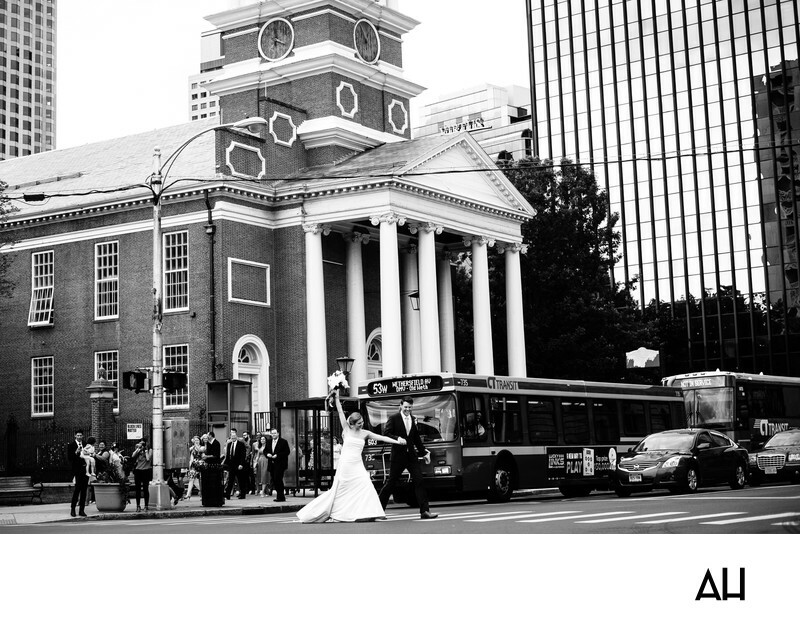 A Church Wedding in Hartford CT is held in a bustling, historic city. This picture from a Church Wedding in Hartford CT shows the bride and groom after the marriage ceremony. The photograph is black and white, fitting with the historical nature of the city. The image focuses on the newlyweds, who have just departed from the brick structure of the church behind them. The building of the church is impressive, completely made of brick and with eight large white columns standing guard at the entrance. Wedding guests stroll down the sidewalk, now that the ceremony has ended and the bride and groom have left the church vicinity to make their way to the reception. The guests look on affectionately as the couple happily run across the street to get to their limo. The bride and groom fly over the crosswalk, past buses and cars filled with unsuspecting people who have suddenly become a part of this special moment. The groom, dashing in a classic black suit, holds on tightly to his wife’s hand. The bride gracefully dances over the pavement, encouraged along by her new husband. The train of her white satin dress flows behind her as she moves forward, rustling quietly amidst the noise of the Hartford city traffic. She throws her free hand up into the air, moved by the intense joy of this moment, her bouquet reaching toward the sky. The bride and groom each smile broadly, now husband and wife. These first few moments of wedded bliss will be remember by the couple for a lifetime, and preserved in these pictures forever.